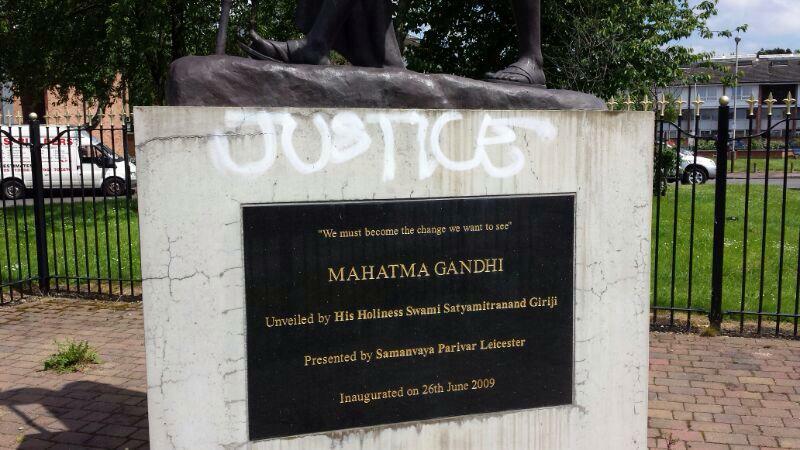 Many Leicester people were appalled and disgusted on Saturday (7 June 2014), when photos emerged on social media showing that the statue of Mahatma Gandhi on Belgrave Road had been defaced. 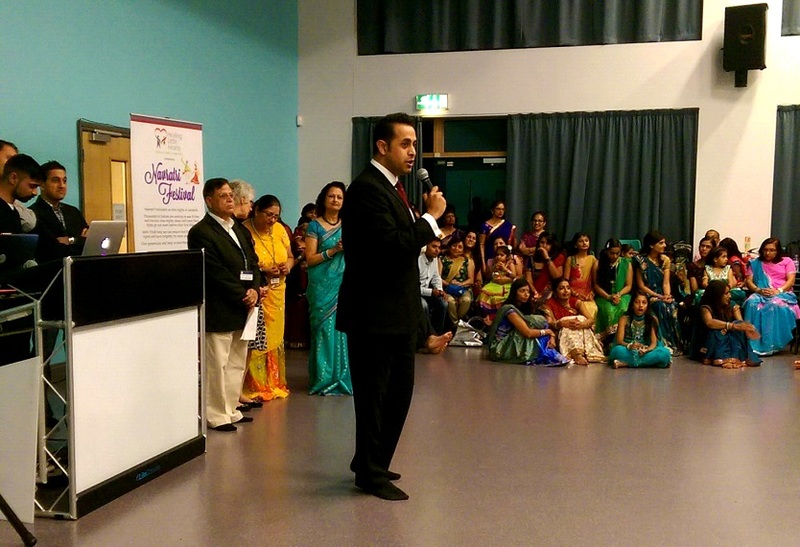 Rupal Rajani from BBC Leicester originally tweeted the photos from her personal account, which had been sent to her by local businessman Vinod Popat. 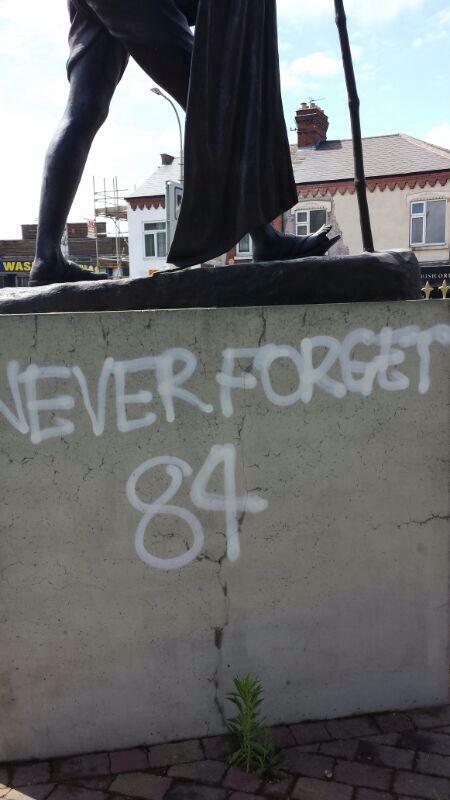 The graffiti on the statue is an attempt to draw attention to the awful 1984 massacre of Sikhs in Amritsar, a major controversy involving the Indian Prime Minister at the time, Mrs Indira Gandhi. However it would seem that the culprit who committed this vandalism isn’t very bright. Either they did not know that Mahatma Gandhi and Indira Gandhi were two very different people and completely unrelated. Or they did know the difference, and they did it anyway, in a bid to stir up tensions in the community. In any event, they have failed. This act only serves to unify Leicester people from all backgrounds and communities, who recognise that it is not a legitimate political protest: it is simply a cowardly act of criminal damage. 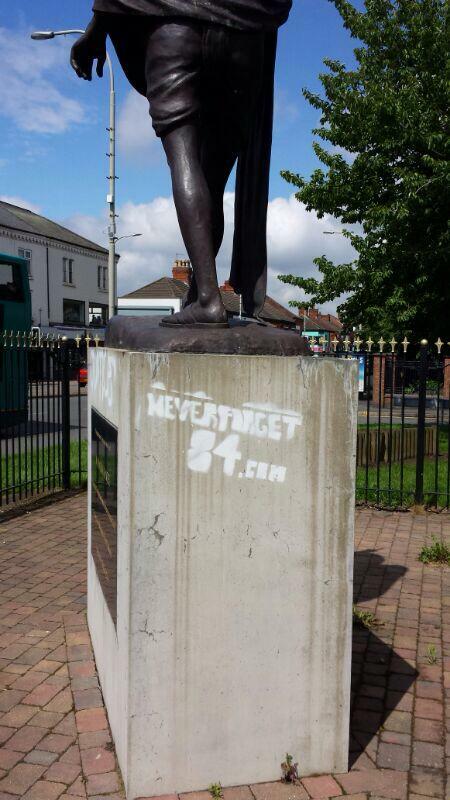 Many of my Leicester Labour colleagues were quick to condemn this pathetic behaviour. 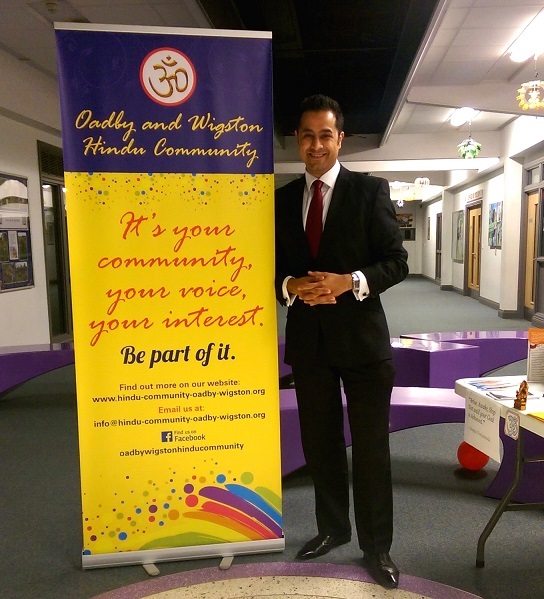 Cllr Vijay Singh Riyait of Abbey tweeted: “we need to be clear that this kind of thing is totally unacceptable”. And Assistant Mayor Cllr Manjula Sood of Latimer telephoned me and told me that “this is entirely wrong and goes against the teachings of Sikhism”. She also agreed to inform the police. 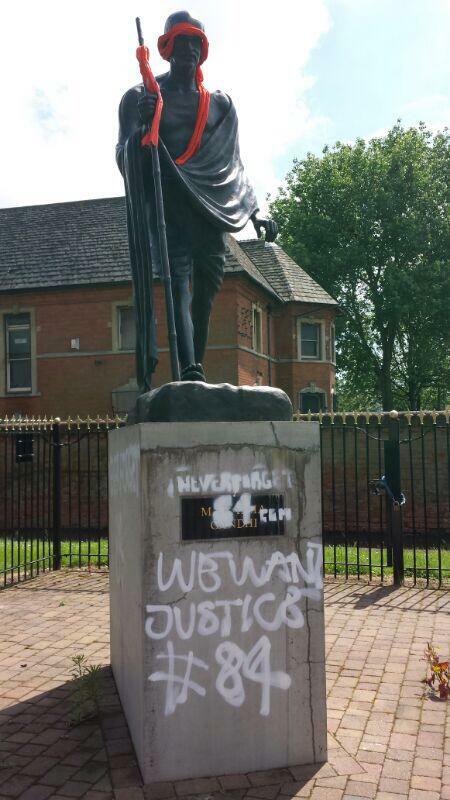 Keith Vaz, Labour MP for Leicester East, tweeted: “Shocked that the Gandhi statue in Belgrave has been defaced. A foolish act of vandalism. 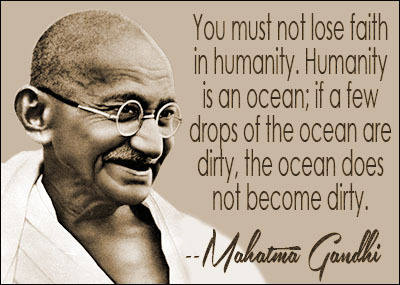 Let’s stay united and strong to honour the great man”. His comments were later retweeted by journalists from the BBC and Leicester Mercury. Having noticed the photos on Twitter fairly earlier on I had immediately emailed them over to City Mayor Sir Peter Soulsby. The City Mayor and his Cabinet colleague Cllr Sarah Russell were very quick to respond, confirming within hours that Council officers would be out cleaning the graffiti on Sunday morning. 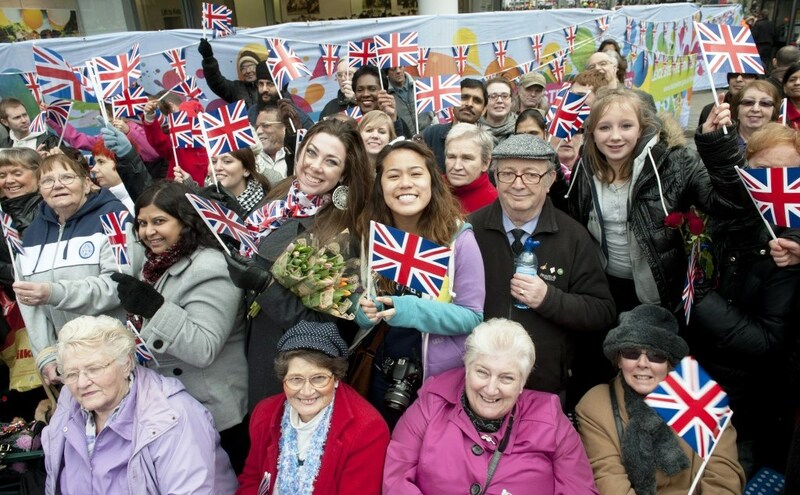 It is great to see that Leicester’s political leaders have taken this seriously. We are also very lucky to have such dedicated Council officers, promptly agreeing to carry out the cleaning work on a Sunday. Some people have questioned why this is such a big issue. Others have even made light of it or tried to justify the sentiments being expressed. For the avoidance of doubt let me be very clear. The graffiti applied to Mahatma Gandhi’s statue is not a legitimate political protest and it absolutely must not be justified under any circumstances. The definition of terrorism is “the unauthorised use of violence or intimidation in the pursuit of political aims”. The desecration of this statue was unauthorised; it was an act of intimidation aimed at the mainly British Indian community living in Belgrave; and the purpose was wholly political. It could be argued therefore that this act of vandalism also amounts to an act of terrorism. An act that was perpetrated by the same kind of closed-minded people who go on to commit far more dangerous acts, because they already have a blatant disregard for the rule of law. These people don’t want to convince us of their political beliefs; they want to force us into accepting them, and they’re prepared to break the law to do it. We are lucky to live in a civilised western society built on the rule of law, human rights, freedom and democracy. Any transgression of these principles is an attack on all of us and our way of life. We must never justify any attempt to influence public discourse through the use violence, force or intimidation. Thankfully I believe that this was an isolated incident and that these kinds of acts are very rare in Leicester. However we must always be prepared to stand together – people of all faiths and those of none – united against criminals and terrorists seeking to take the law into their own hands to advance their political beliefs. Ultimately we have this statue of Mahatma Gandhi in Leicester for the same reason that we have Nelson Mandela Park and may soon have – thanks to Cllr Adam Clarke of Aylestone – a statue of Alice Hawkins: We choose to honour great people and inspire the next generation. We will not be intimidated by stupid cowards who break the law. 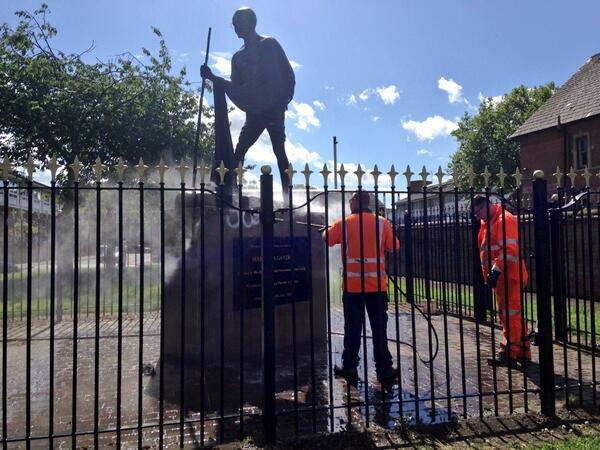 UPDATE: The statue of Mahatma Gandhi has now been cleaned. This was done within 24 hours by Leicester City Council officers. Photo credit: Emily Anderson, BBC News. Leicestershire Police are investigating and two arrests were made on 11 June 2014. Anyone with any information should contact Leicestershire Police on 0116 222 22 22. I visited Gilroes cemetery in Beaumont Leys earlier today to pay my respects on the 70th anniversary of D Day. 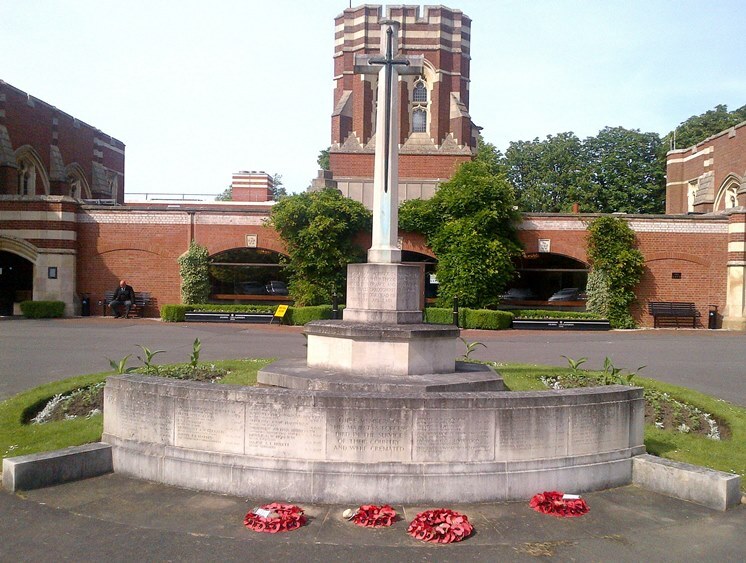 Leicester’s Gilroes cemetery contains 110 Commonwealth war graves from World War I and 160 from World War II. There is also a memorial in front of the crematorium which commemorates the 31 service personnel whose remains were cremated there. The weather today was sunny and bright and it was very peaceful. There was a funeral taking place inside. Outside, tiny squirrels were darting about, picking off petals from the many floral tributes. It was just another ordinary day at the cemetery. Seventy years ago however it was anything but an ordinary day for our country and for many countless men and women. The Normandy landings ultimately helped the Allies rescue the continent of Europe from the grip of hatred and injustice. Everything we have in Britain, including the freedom to choose how to live our lives, is thanks to the bravery of countless extraordinary people who came before us. We owe them a debt of gratitude we can never repay. However we can honour their memories and sacrifices by ensuring that future generations never forget. “Congratulations to Narendra Modi, incoming Prime Minister of India, and the BJP / NDA on their emphatic election victory. Congratulations also to the many British Asians, and Non-Resident Indians living in Britain, who have been actively campaigning for this election result. It has been fascinating to observe the politics of India in recent years and particularly the 2014 general election. It is a testament to the strength of Indian democracy that the campaign has been largely peaceful and that Congress and other political parties have humbly accepted the people’s verdict.